Ten fun films for kids! $5 for ten movies when purchased in advance at the box office. $1 per show when purchased at the box office. All films Rated G or PG and all show times are at 10am. Our signature camp experience where campers will participate in either Football, Basketball, or Soccer! + T-Shirt, Snack, and Raffle Prizes included! We are trying something new this year – the Alliance Summer Experience! Mrs. Edinger is offering 2 classes on Magnets – one for 1st-2nd grade and one for 3rd-5th grade. Mrs. Southworth is offering 2 Art classes – one for 1st-2nd grade and one for 3rd-5th grade. Parents are not required to be in the classroom. A registration form is being put together, and will be sent out shortly. 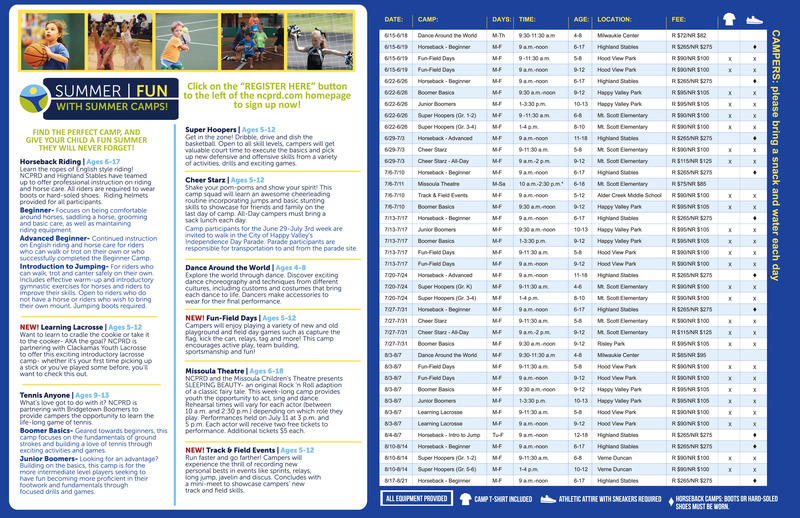 Copies of the summer activities guide, filled with activities for children, teens, and adults, are available atwww.gladstone.k12.or.us, or by calling 503-650-2570. Space is limited. To register, call Chelsea Hamilton at 503.496.5764 or emailParentingNowFSS@gmail.com. Get your toes tapping with a tap dancing saxophonist. Explore the Deep Woods with folksongs and puppets. Bouncing, wild fun (like an untamed rubber band) from a two-time Guinness World Record holder. See snakes, lizards, and turtles all rescued from the Pacific Northwest, brought to your library. A funny and wacky show bringing a comedy twist to juggling and magic tricks. View 15 exotic birds, including some endangered species, and find out more about their lives and how to protect them. Anything’s possible in this variety show featuring unicycling, magic and plate spinning. It’s up to a team of LEGO characters to save their world. Brought to you by the Friends of the Library and NCPRD. As a result, we are happy to offer our own recommended reading list. The 2014 PDF version of the Outside of a Dog Book List offers 50+ titles for each grade. Full of genuine classics and family favorites, it doesn’t promote a liberal agenda, cater to the lowest common denominator, or present books designed to make anyone look smart. It’s a list meant simply to open the wide doors of reading to kids turned off by more standard fare, to help kindle a love of reading.From the feedback we’ve received the last two years and after doing further reading ourselves, we’ve continued to update Outside of a Dog. For 2015, we have created website lists for each grade, added ratings and cautions to many of the books, adjusted a few grade level suggestions (primarily in the 7th and 8th grades), removed a few books and added others, continuing to make the list more unique and a little less curriculum-based. 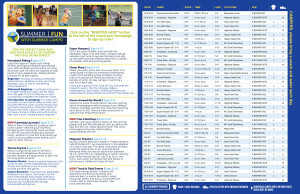 You can view the updated website lists here.Who Can Do It? Any student grades 1-12. Preschool and kindergarten readers may also sign up, but they will be enrolled as first graders. YOU DO NOT NEED TO BE LOCAL. You can download the free booklist via pdf or view the website lists, and your book logs can be completed online.Cost: $5 per participant. If you sign up online, please include each child’s name and grade in the order comments (we’ll be calling if you don’t!). Since we believe our list is a bit on the challenging side, we suggest signing your child up for the grade they just finished—not the one they are entering. You, of course, are free to make that decision. While we are thankful if you choose to support the program by buying literature from us, you are under no obligation to buy a single book. As an extra incentive, we will email a coupon code to registrants early in July. Students must enroll by August 15th, and no refunds for the program will be given after that date. The digital booklist is free, but you can also purchase a printed copy of the 2013 version of Outside of a Dog ($3 each—sales of this will help fund the prizes). • Don’t start reading until June 1st! No fair getting a head start! • Read at least five books from Outside of a Dog (grade level or above). Each participant who does that will receive one $5 gift certificate to Exodus and one entry into the grand prize drawing. If you read five qualifying books from the website (not from the list), we will still award a certificate, but you will NOT be entered into the drawing. • Keep reading, and you’ll have more chances to win. • Additional books must be from our website and be grade appropriate. Your student’s digital booklog will verify that the book is on the site and appropriate for their grade level. If you read a book that does not register and think we should list it, please let us know by July 31 so we can decide whether to include it. • Kids must READ the books themselves. Audio books and read-alouds, while wonderful things, are not the same experience. We realize this doesn’t allow some younger kids to participate—but this program is not intended for pre-readers. If you need an exception for special circumstances, please call. • High school students must read two non-fiction titles. The other three are up to them. • The books must be UNABRIDGED. Each registrant will receive access to a digital book log. Please record the titles you read and rate the books there. Everything posted from June 1st to August 31 will count towards final numbers. If you can’t access it, download the printable book log, fill that out and submit it by mail or in person before August 31. • Parents: PLEASE confirm your students actually read the books! • Read 35 books and get a $10 certificate to Exodus. • There will be one $25 grand prize for most books read. • Read 25 books and get a $10 certificate to Exodus. • There will be one $50 grand prize for most books read. • Read 5000 pages and get a $15 certificate to Exodus. • There will be one $100 grand prize for most books read. This will include all participants who have read the five book minimum or more (other grand prize winners are ineligible). Important!! Prizes will be awarded via emailed gift certificates on the second Friday of September (or as close to that as possible). They cannot be awarded before. We are currently funding all the gift certificates, but we would love help! If you would like to help sponsor gift certificates or donate other prizes, please give us a call. Sponsors will receive advertising in the reading program emails. If you have questions, please give us a call at 503-655-1951.
o Portland Parks & Rec Swimming Pools (Portland, $): Enjoy a dip in a public indoor or outdoor pool! Be sure to also check out the summer movie events — enjoy a family movie from your floatie! o Kennedy School Soaking Pool (NE Portland, $): Enjoy a refreshing soak in the non-chlorinated saltwater pool. A local favorite. o OMSI (SE Portland, $$): Special dedicated area for preschool kids plus exhibits that will interest the entire family! $2 admission on the first Sunday of every month. o Portland Children’s Museum (SW Portland, $$): Check out the new outdoor exhibit:Outdoor Adventure, along with all other types of educational fun for little ones. Get FREE passes through your public library and on the first Friday evening of the month. o Jamison Square (Downtown Portland, FREE): Cool off at the huge outdoor fountains and enjoy walking along the Willamette River. o EV Celebration Day (Downtown Portland, FREE); July 5 — Electric Vehicles and charging devices will be displayed on the Square to educate the general about the benefits of Electric cars. Pioneer Courthouse Square. o Yoshida’s Sand in the City (Downtown Portland, FREE): July 18-20, 2014 – Watch teams of sand artists create gigantic sand sculptures to benefit Kids on the Block at Pioneer Courthouse Square. o Washington Park (SW Portland, FREE-$$): Includes Portland’s Children’s Museum, The Oregon Zoo, Japanese Garden, World Forestry Center, International Rose Test Garden, Hoyt Arboretum, and one killer playground. Easily accessible by the MAX train. o Alpenrose’s Dairyville (SW Portland, FREE): Head to Alpenrose Dairy’s Western-themed town located right on the 52-acre dairy farm! Visit a bakery, bank, school, and post office as well as watch model trains chug through tiny Oregon landscapes. Stop off at the Ice Cream Parlor for a delicious Alpenrose ice cream cone. Open Sundays from 1-4 pm, June 1-August 31.
o Portland Timbers (Downtown Portland, $$$): Catch one of Portland’s two professional sports teams. Not a soccer fan? Don’t worry. Watching the Timbers Armyis worth the price of admission so try to grab a seat at the north end of the park. o Oaks Park Amusement Park Preschool Rides (SE Portland, $$): Kids ages six and under get the run of Oaks Park every Tuesday and Wednesday morning from 9:30-11:30 throughout the summer. Admission includes unlimited preschool rides, milk, and cookies plus storytime with an Oregon Dairy Princess. Begins June 17, 2014.
o Fort Vancouver National Historic Site (Vancouver, WA, $, FREE for kids): Explore the lands and structures at the center of fur trade and military history in the Pacific Northwest. Great fun for kids. o Powell’s City of Books (Downtown Portland, FREE): Peruse the largest used and new bookstore in the world. o Portland Saturday Market (Downtown Portland, FREE): Open every Saturday and Sunday through Christmas. o Portland Rose Festival (Portland, FREE – $$$): Memorial Day weekend – mid-June — Celebrate all things Portland during this three-week city-wide festival. Includes two parades, a 5K run, amusement rides, and so much more! Get an unlimited ride wristband plus 3 games at the Rose Festival CityPark for $28 (Tom McCall Waterfront Park). o Portland Festival Symphony (Portland, FREE): July-August – Experience the music at seven events at area parks. o Movies in the Park (Portland, FREE): End of June – early September — Catch a summer flick at Portland area parks. Movies start at dusk; pre-movie entertainment begins at 6:30 pm. o Concerts in the Park (Portland, FREE): July – August — Enjoy a free concert at Portland area parks. Starts at 6:00 or 6:30 pm. o OPS Fest (Portland, FREE): June – September — Experience a new style of Shakespearean performance! Actors perform the way Shakespeare’s own actors did: in the open air, in natural light, with minimal sets, and with great, fast-paced, energetic acting and lots of audience interaction! 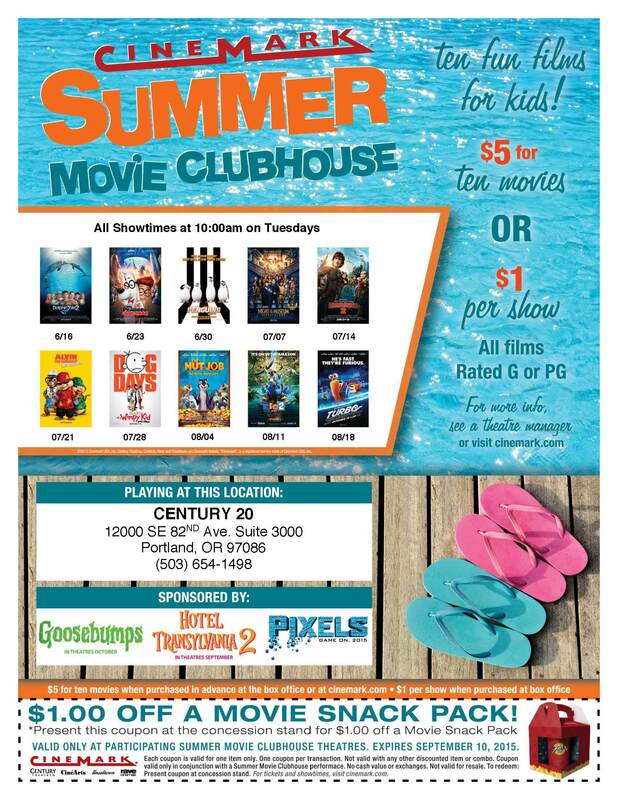 o Regal Cinemas Summer Movie Express (Portland Metro, $): Family friendly movies for $1 per person at participating Regal Cinemas on Tuesday and/or Wednesday mornings. 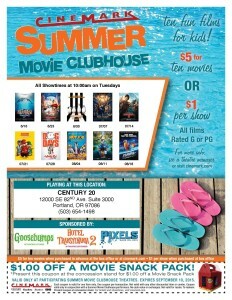 Also check out Cinemark’s Summer Movie Clubhouse for more options. o Flicks on the Bricks (Downtown Portland, FREE): End of July – August — Free movies each Friday at Pioneer Courthouse Square. o Portland Actors Ensemble (Portland Metro area parks, FREE): June – September — Experience Anthony and Cleopatra and A Midsummer Night’s Dream in area parks. o Portland’s Food Carts (Portland, $$): Explore an incredible array of cheap and unique eats with carts located around Portland. You can even take a guided tour! o Portland’s Farmers Markets (Portland Metro, FREE): Hit a market every day and enjoy local food and wares. o McMennamins (Portland Metro, $$$): Unique pubs, restaurants, breweries, wineryand hotels. The food is good, but go to experience the renovated historical locations. Well, and the food. o Burgerville (Portland Metro, $-$$): The very best in fast-food. High quality ingredients, great prices, and crazy about local sustainability. Conveniently located throughout the Portland Metro area. o Marine Drive Bike Path (N Portland, FREE): Easy, 12+ miles of paved trail along the Columbia River. o Powell Butte Nature Park (SE Portland, FREE): Mountain bike and hiking trails in the middle of suburbia. o The Springwater Corridor (East Portland, FREE): A scenic, widely paved trail, encompassing wetlands, buttes, agricultural fields and pastures, residential and industrial neighborhoods. Bike and pedestrian friendly. Runs from Boring to the Willamette River. o Eastbank Esplanade (SE Portland, FREE): 1.5 mile trail that travels the Willamette River to Waterfront Park or wind your way back to The Springwater Corridor. o Sunday Parkways (Portland, FREE): Walk, bike, roll, and discover active transportation while enjoying various Portland neighborhoods. Five Sundays throughout the summer, sponsored by the Portland Bureau of Transportation. o Providence Bridge Pedal (Downtown Portland, $$$ for adults, kids are FREE ):Sunday, August 11, 2013 — The only way to truly enjoy the Willamette River bridges – including the top decks of the Fremont and Marquam bridges. Bike and walk options available. o Pedalpoolza 2014 (Portland, FREE – $): Enjoy 3+ weeks of bike fun with over 250 different events June 5-28. There are family-friendly events in addition to adult-only rides. o 4T Trail (Portland, $$): Explore the city with this four-mile hiking trail and the combined rides on the OHSU tram, Portland trolley, and MAX train. Takes about 4 hours to complete. o Crystal Springs Rhododendron Garden (SE Portland, $): Enjoy over 2,500 rhododendrons, azaleas, and companion plants. o Forest Park (Portland, FREE): Eighty+ miles of jogging, hiking, and biking trails with 19 trailheads for easy access (maps are available at REI, New Seasons, Powell’s andother PDX locations). o Japanese Gardens (SW Portland, $$): Proclaimed the most authentic Japanese garden outside of Japan. Free guided tours with admission. o Multhomah Falls (Columbia Gorge, FREE): Discover Oregon’s tallest waterfall from both the bottom and the top. Depending on your energy level, you can take the moderate 2.2 mile hike to the top, a difficult 5.4 mile look that includes Wahkeena Falls, or just enjoy the view from the bottom at Multnomah Falls Lodge. o Pittock Mansion (NW Portland, $$): Take a self-guided tour of the home of Henry & Georgiana Pittock, Portland pioneers.